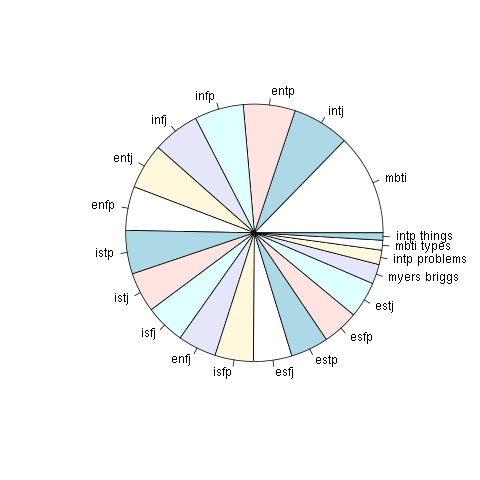 While I have been working on my personality type project, I have also made a detour with the tag analysis. So I wanted to know, what can I found out from what kind of tags do they use. For the first exploratory analysis, I used the bottom code. The first one is the following. Yes, I am aware, that the piechart is one of the worst ways to represent the data. But I wanted to also learn how to do it, in case I ever get a weird request. For all of your purist, here is a different representation, that tells you quite similar data. Here I think I need to put a warning for the people trying to explain this graph. These tags were taken from the posts that were tagged with either 'mbti' or any of the types tags. So the overrepresentation of these tags could be based on this. And it is which tags are together, not which types use which tags. Still, does the first non-type like tag for INTPs have to be 'intp problems'? I mean, we don't have that many problems, right? 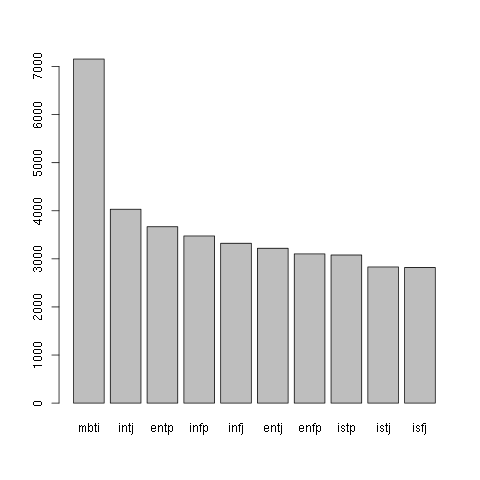 But then again, here is the list of most frequent tag, if we ignore the type (intp, istp, infj, estj, enfp,...) and mbti tags (mbti, myers briggs, mbti types, all types,...), for each type. What we can see from this is that introversion is more a talk than extraversion, and usually in connection to the introverted types. On the other hand, cognitive functions are usually discussed in connection to the extraverted types. Let this be overall, of specific functions. There are some non-surprising things, like that people like talking about personality in connection to the personality types. I am not entirely sure, what the submission tag is supposed to be. I hope it is submission as in I submit something to the art competition, than submission as I submit to my master. Could be either. For the last part, I would like to show the distribution of the tags. I have printed here the most frequent 500 tags. 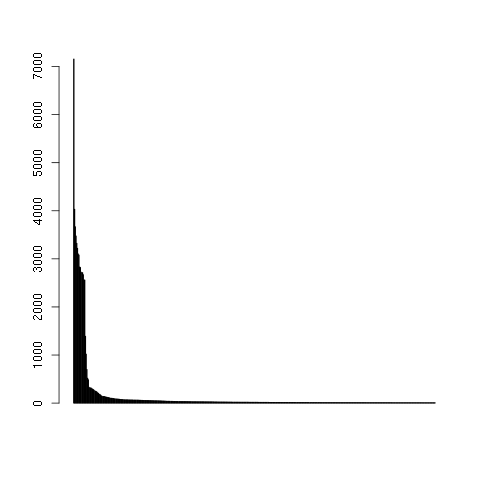 As you can see from the picture, the power law here is easily seen. Kind of shows, that just a small amount of tags is used in combination with this tag. But that there are a multiple tags, that are used only a couple of times or even only once. If you want to do some other interesting analysis, you are free to take my tag file.